Coach Chuck Gurney building a tradition at all levels. Winthrop softball coach Chuck Gurney peered into the future when he took the head coaching job four years ago. And he saw a strong group of eighth graders waiting in the wings. Staff photo by Joe Phelan Winthrop pitcher Layne Audet is in her third season in the circle for the Ramblers. The Ramblers made school history a year ago when they finished the regular season 11-5 and, for the first time ever, reached the Class C South regional final, knocking off traditionally strong teams from Telstar and Monmouth along the way. They lost to perennial power Madison in the final but the trip to the championship was a game-changer. The softball team has experienced incremental success, going 3-13 in Gurney’s first year, then 5-11 with a playoff appearance, before last year’s leap. This season the Ramblers are 8-3 in Mountain Valley Conference play and coming off a big win Wednesday against Carrabec. Their three losses have all been by one run, including a 1-0 loss to unbeaten Madison, long the gold standard in the MVC. “She took me in like a family member,” Gurney said. Kayleigh played a big hand in Winthrop’s success and this year starred at the University of Maine at Farmington. Gurney has the same hopes for this year’s crop of juniors, but doesn’t measure their success just through wins and statistics. Dave Audet and Jeff Perkins are Gurney’s varsity assistants while Joe Burnham, who used to coach the junior varsity team, is head coach at the middle school. There’s also a 12-under team that’s having some success. The team raised $2,000 on its own this season to buy a new pitching machine and, along with the school’s sports boosters, has made a strong effort to fill its needs. “The more we get the community involved the more kids want to play,” Gurney said. With six juniors and one senior on the roster, the Ramblers might appear to be a year away, but the MVC is a tossup this year, despite Madison’s unbeaten record, and there are a half dozen teams that could win a regional title, Winthrop among them. 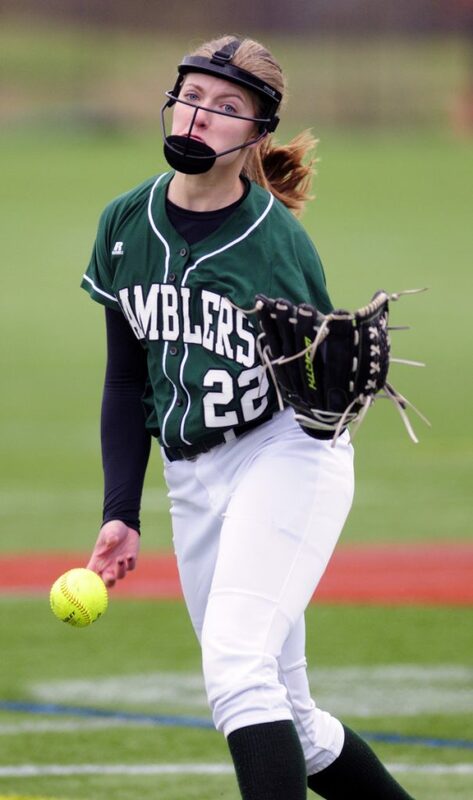 Audet, now in her third season on the mound, has added three or four miles an hour to her fastball, harnessed her changeup, and hasn’t allowed more than four runs in a game this year. Gurney was concerned about replacing Oberg behind the plate but junior Hanna Caprara has eased his worries. Wednesday, she belted a home run in Winthrop’s 4-3 win over Carrabec. The defense has played well, but hitting, at least early on, has been key. The team brought in a hitting coach and the pitching machine has helped as well. The Ramblers face two significant tests as the regular season winds down, both against Lisbon, which is 8-2 and averaging 13 runs a game. “They look like the best offensive team I’ve seen,” Gurney said.